Ask The Bellwether: How do you drumcard stripes? How do you drumcard stripes? The highlight of my drumcarding workshop is the striped batt. 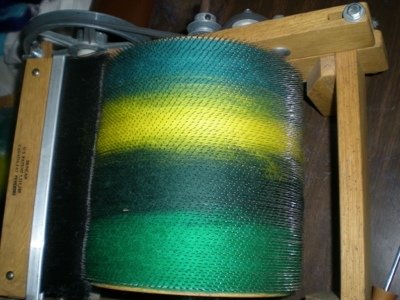 If you simply put colors side by side on the drum carder, you get stripes, but often, the batts fall apart at the color changes. To overcome that, overlap the colors a little so they merge at their boundaries. These striped batts aren't done once they are removed ... You need to turn them into rolags. To do this, pull them in half so you have two short batts. Take each short batt, and pull them in half again. This gives you four very short batts. 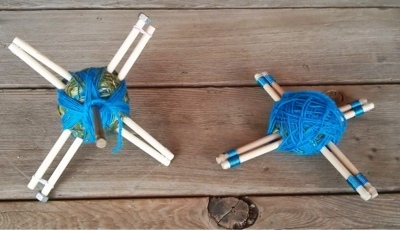 Roll each one up into a rolag, using a dowel or knitting needle to give you a form to roll around. 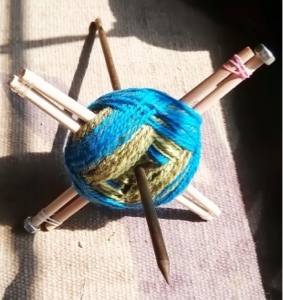 Each rolag has the colors along its length, so you can spin them up into yarns with colors appearing in each order. The overlapping color at the changes will create some heathering in the yarn. I like to spin two batts up and then ply them against each other ... since the color changes won't match up exactly, I get some heathering from that as well. During plying, I found I must have had one rolag with a lot more fiber than the others. So I did what any good author will do: I edited my yarn. The one that was not changing fast enough was broken, the extra color removed, and then a plying join was used to rejoin it when it started the change I needed. Spindle-spun and plied on a homemade Turkish spindle from rolags made from a striped batt. Fiber: commercially died superwash merino laps and top, drumcarded into a striped batt. To be knit into a self-striping hat with another batt of the same colors. It's always a good idea to add extra info; the fact that I made the spindle may interest the judge and get me "points" for that extra effort. It's worth pointing it out, since I started from commercially prepared fiber rather than raw fleece, losing me a few "points" on the effort involved in processing. If my drumcarding workshop is of interest to you, upcoming workshops are listed on www.thebellwether.com under Take A Workshop. I have taught this workshop via Skype and privately, as well as at various wool shows, and would be happy to do so again. I have yet to really do any drum carding, but I finally purchased a drum carder, and plan to start doing some soon. Thank you for explaining so well, how to add the stripes of color to the bats, and how to divide them for spinning. That will be very helpful when I start making some for myself. I would love to know more about the construction of your turkish spindle. Very cool stuff here :).